Doctoral programme is designed for graduates of Master's (engineering) programme. Doctoral study is a following, higher and more demanding form of education for which the Faculty of Mechanical Engineering offers a number of fields of study. Students learn to solve the most challenging tasks of applied science and practice. The study is carried out in accordance with an individual study plan and completed with a state doctoral examination and defence of a dissertation which demonstrates the student´s capacity for independent and creative scientific work. Graduates of doctoral studies are awarded the academic title of "Doctor" (Ph.D.) which is compatible with a similar title provided by foreign technical universities. Biomechanics deals with the mechanical properties, functions and problems, such as statics, kinetics, dynamics, biorheology, bioviscoelasticity, biotolerance and damage to living systems and their replacement on the basis of general methods of continuum mechanics. It is therefore an analysis and synthesis of the mechanical response of living organisms to various internal and external impulses from the viewpoint of physiological and pathological phenomena of living organisms, innate and sustained defects, injuries, etc. Biomechanics also contributes to the development of instrumentation, non-invasive diagnostic and therapeutic methods. Focus is namely on the following topics: biomaterials and their bio tolerance properties, constitutive equations of the ligament and cartilage including bio tribology, bio viscoelasticity, stress and ultimate strain tensor, soft and solid tissue, biomechanics of the bone tissue and its remodelling, mechanics of bone tissue injury and fracture remedies, design of orthopaedic implants and materials, biomechanics of large human synovial joints and their replacements including pathological cases, hydrodynamic properties of synovial fluid, smooth and skeletal muscle mechanics, muscle fatigue, musculoskeletal system mechanics, mobility control, human spinal column biomechanics. Other topics concern cardiomechanics (cardiac valve mechanics, passive and active myocardial properties) and vascular biomechanics (constitutive equations of artery walls, dynamic response of the artery and perivascular tissue), hemodynamics - namely flow of blood in bifurcations and stenosis, mechanics and optimization of artificial arteries, bioprothetic valves. Biomechanics of the pericardium and coronary arteries. Biomechanics of erythrocytes, leukocytes, viscoelastic properties of blood plasma. Flow properties of lymph. Dental mechanics and orthodontics, biomechanics of hearing. Biomechanics of injuries of the brain, spine, thorax and pelvis. Problems related with biolocomotion, ergometry and biomechanics in rehabilitation. Biomechanics includes tissue engineering which deals with investigation of functional relations of normal healthy and pathological structures of the human tissue in order to develop biological substitutes. These substitutes serve for renewal, preservation or improvement of physiological functions of tissues, including the development of intelligent biomaterials. Experimental biomechanics of soft and solid tissue. This branch covers a wide scope of problems related to the acquirement, transformation and application of all basic types of energies indispensable for the function, development and stability of the national economy. Basic theoretical study provides fundamental knowledge of mathematics, physics, thermomechanics and fluid mechanics and other theoretical fundamentals of the field such as e.g. combustion theory, nuclear reactor physics, thermohydraulics of power production equipment. In the sub-branch of thermal power production equipment problems are solved of the combustion of fossil fuels, steam and gas boilers, steam and gas turbines and all types of heat exchangers, condensers and cooling towers. In all problems investigated a minimization is observed of the detrimental effect of thermal power production equipment on the environment within the range of economically acceptable measures. The main problems concerned are the denitrification and desulphurization of combustion products and fluid combustion technologies including coal gasification.In the sphere of nuclear power production equipment the doctoral study programme is mainly focused on problems concerning the safety of the above equipment, assessment of the hazards of this type of equipment and prospective nuclear energy systems.Within the sub-branch of compressors, refrigerating equipment and hydraulic machines, problems are solved pertaining to compressors, vacuum and cryogenic technologies, hydraulic machines, refrigerating technologies and buildings and application of heat pumps including exploitation of solar and wind energy.Included in this field is also a sub-branch of applied electronics which covers measuring methods, electromechanical phenomena and electric drives in power production engineering. This field of study guarantees scientific research and independent creative activity of students in the field of research and development performed at the faculty, at research institutions and in the industry itself. The postgraduates apply theoretical knowledge obtained by further studies of up to date topics of basic and applied mostly engineering courses and topical knowledge from the field obtained by mastering methods of their study. Another pillar of the study is mastering computation and simulation tools based on modern HW and SW and means of experimental research on models and real parts related to the issues of the dissertation. The postgraduates learn to design parts, subassemblies and complete machinery not only for general engineering but also for specialized fields such as production engineering, handling and transportation technology, apparatuses and lines and equipment for non-engineering production processes. Besides mastering the design, the postgraduates are prepared to deal with both engineering and non-engineering production processes. In the field of engineering processes they are mainly analyses of production requirements with regard to production equipment and control technology, handling and transportation of parts and apparatuses and equipment for control of engineering and non-engineering processes. The programme regards also non-engineering processes such as: processes, equipment and lines for chemical, food processing and consumer industry; biotechnologies and industrial ecology and also pharmaceutical and hydrometallurgical industry, plastics production and related fields. The programme aims to train the graduates to use their knowledge and further skills to investigate in a comprehensive way and impartially evaluate and formulate originally obtained results of the assigned R&D projects including international presentation and implementation also with respect to the protection of intellectual rights. The field of mathematical engineering covers namely the following areas: mathematical analysis, numerical mathematics and methods, mathematical modelling, probability calculus and statistics, graphic geometry and computer graphics. All fields support both the theory and application especially in technical sciences. 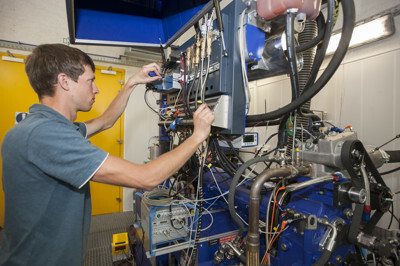 The field of physical engineering covers namely the following areas: low-temperature plasma physics applied to plasma technologies, solid-state physics directed towards x-ray analysis and study of thin layers, properties of semiconductor materials from the viewpoint of detection of ionizing radiation and mathematical modelling of mass and heat transfer in industrial applications. Doctoral study deepens the knowledge of the physical nature of properties of metallic and non-metallic materials in relation to their electronic, atomic, molecular and crystalline structure. Emphasis is laid particularly on assessment of the structure and properties of materials, their processing, diagnostics and application in engineering and other fields, e.g. biomedicine. Students can choose whether their study programmes will be focused on metallic materials, metal matrix composites (MMC) or on polymers, ceramics and polymer matrix composites (PMC). Doctoral study in this field follows the field of study Applied Mechanics and certain design fields. The study programme provides the highest possible education in technical mechanics of solids, deformable bodies and continua. The field comprises mainly methods of modelling of machine equipment and assessment of the corresponding fields of validity of models by means of mechanics of bodies, machine mechanics, oscillation of mechanical systems, experimental methods in mechanics, statistical mechanics, controlled mechanical systems, strength of machine structures, material fatigue, experimental elasticity, theory of elasticity and plasticity, technical continuum mechanics, dynamic strength and lifetime. The graduates gain expert knowledge corresponding to the selected field of study and thorough theoretical fundamentals of the entire field. Graduates of this doctoral study programme are able to master independent creative scientific work in fields of their dissertations, e.g. theory of enterprise management, strategic management including organizational structuring as well as in marketing, business policy, and enterprise management including logistics, management and design of production, economics and ecology. Among other fields can be named economics, both macro and micro, accounting theory, financial theory including managerial information systems and enterprise financing. Human Resources management represents an independent scientific field which includes enterprise personnel management, ergonomics and safety and work hygiene. Among other fields there are: information management including information technologies, automated information systems and quality management including statistical analysis. Doctoral students gain theoretical and deeper technical knowledge for a scientific approach to manufacturing technology and/or related fields. The research covers technological processes of production of semi-finished products, machining and renovation of machine parts, assembly of mechanical engineering products and equipment including quality control systems in mechanical engineering oriented on manufacturing. Doctoral students expand theoretical fundamentals and application knowledge from materials engineering, technology of casting, forming, welding and surface treatment. Students can also gain knowledge from the theoretical and methodical study of technological design of production processes and systems based on application of general and systemic relations between particular technologies and requirements for integration, automation and effectiveness of production processes. PhD student reaches an original contribution even in general methodical apparatus of Technical Cybernetics. Doctoral study in this field is focused on preparation of experts in conceptual design and assessment of technological equipment for modification of indoor and outdoor environment. The main topics include equipment for the protection and monitoring of air quality (collectors of solid and gaseous emissions), equipment for the reduction of noise and vibrations, equipment for modification of the microclimate and air quality both in living and working environment (ventilation, heating and air-conditioning equipment), heat supply equipment and equipment for use of alternative sources of energy. Theoretical fundamentals are given in more detail above all in mathematics, fluid mechanics, heat transfer and theory of behaviour of particular substances. Theoretical subjects of this field and special courses comprise selected items from heating, ventilation and air-conditioning, aerodynamics, technical acoustics, control, dust collecting, heat supply, alternative sources of energy, modification of microclimate, mathematical modelling and experimental methodology. The professional preparation is also strongly focused on expansion and extension of knowledge of theoretical methods including methods of mathematical modelling and simulation of processes and experimental solution of technical problems. This field of study is focused on training highly qualified specialists in fluid mechanics, thermodynamics and transfer processes. Broad theoretical knowledge is creatively applied to solution of complicated stationary and non-stationary problems of internal and external mechanics of compressible and incompressible fluids with potential heat and mass transfer. Students gain knowledge of mathematical modelling and get acquainted with experimental methods and means applied to solution of problems related to this field. There is an emphasis on physical aspects of the phenomena in order to enable the graduates to be able to adapt to variable requirements of industrial experience in various branches of mechanical engineering, e.g. in bioengineering.